Our Strategy establishes how we will work towards our vision to empower all students to make their time at University count. To carry out a corporate governance review and consultation on our democratic governance with stakeholders. To clarify and fully implement HUU’s pay and reward policy for all employees and workers. To develop and mobilise a digital strategy for the Union group. With the purpose of improving the student experience and creating efficiency internally. Working with the University of Hull to complete the planned remodel and refurbishment of the Union group’s commercial, social, and office space on the ground and first floors of Student central by June 2020. To work with the University of Hull to understand, interpret and respond to the impact the challenging Higher Education operating environment is having and will have on both organisations moving forwards. 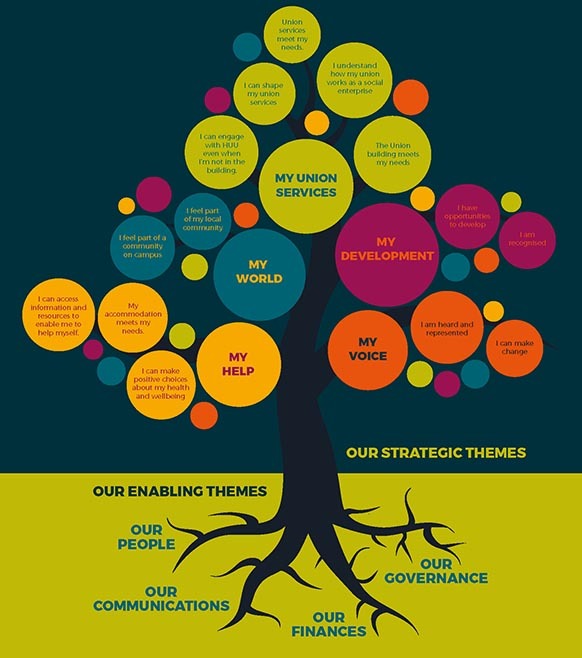 Our members defined our five member priorities which form the branches of our 'strategy tree'. Under each of our priorities we identified what our members would say if we were we met our aims. This is what success sounds like to us. All students have the opportunity to participate in and affect change in their University, Students’ Union and the wider community. We provide flexible advice and support mindful of our members’ unique circumstances. We provide advocacy for students on key issues. Our members are empowered to make informed choices and to take action on their own behalf. We promote mental and physical health and wellbeing through our services, events and products. We will work in partnership with key stakeholders to improve accommodation quality in Hull. We provide excellent, value for money accommodation services. We provide services that are relevant to every person studying at the University of Hull. Our students are able to influence the services we provide. Our members understand that HUU is a social enterprise. Our students are empowered to run events and activities in our spaces. We have a strategy for the long-term development of the Union Building at centre of student life on campus. Our spaces are welcoming, safe and accessible for all. We have identified and provides key services which are accessible to all members, including those studying at a distance. We make best use of the digital environment to provide services to members on and off campus. Our members understand the skills and experience they've gained from their involvement with us. We celebrate the successes and achievements of our members. Our diverse membership has a sense of belonging in their community. We are a key stakeholder and integral part of our residential communities. We offer our students a role and representative voice in community development and engagement. Our local communities recognise the positive impact that students have. Our members are aware of the range of activities and opportunities available in Hull. We provide an attractive, inclusive and fun welcome for our new and returning members. We facilitate students creating vibrant and inclusive campus communities.